Hey, remember that AC/DC-themed version of Rock Band we told you about a few weeks ago? According to the NY Times, it's due to be formally unveiled by MTV tomorrow. Harmonix To Release Rock Band: AC/DC? And what's more, it's to be formally unveiled with a hefty caveat. Like, it's only going to be available at Wal-Mart. So Rock N Roll! Officially branded AC/DC Live: Rock Band Track Pack (most likely featuring tracks from their Castle Donington show), the expansion is (as we also told you a few weeks back) one piece in a massive marketing move by the band's label, Columbia Records, which will see special AC/DC "areas" set up in each of Wal-Mart's stores, selling not just the expansion, but AC/DC's new album and all kinds of merch. 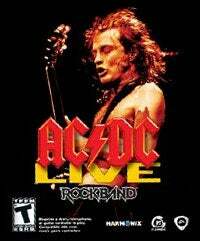 AC/DC Rock Band Is An "Expansion Pack"
They rock hard, and that still works for our audience. It comes down to getting really great marketing, because Wal-Mart is so meaningful in terms of sales if they get behind something. If you want to be a physical band, you better make an alliance with a strong physical retaile. It's a great way to sell the new album, the catalog, the game, merchandise and DVDs. The expansion will retail for between $30-$40 (NYT say $40, Wal-Mart say "from" $30), which is a bit steep when you consider there are only 18 tracks. All 18 will, however, "also be available for play in Rock Band and Rock Band 2", according to Wal-Mart's product page, though it's unclear whether that means the tracks will be made available as DLC or whether you'll be able to export them, ala Rock Band 1 songs into Rock Band 2. As for a release date, that's pencilled in for "all consoles" in early November. The exclusivity deal means the game's not only available at Wal-Mart stores, but Sam's Club and Wal-Mart's online store as well. This is sure to sell well, what with the band's continued popularity, but we can't help but shake the feeling this is all getting a bit much.